I have been at LongMeadow farm since April 2013. I meet Rita Brown from riding in her clinics. I was immediately impressed by her professionalism and skill. Before coming to LMF my horse Dante and I struggled with so many aspects of the training scale. He was nervous, tight and possessed little to no confidence. I also was a timid and nervous rider. 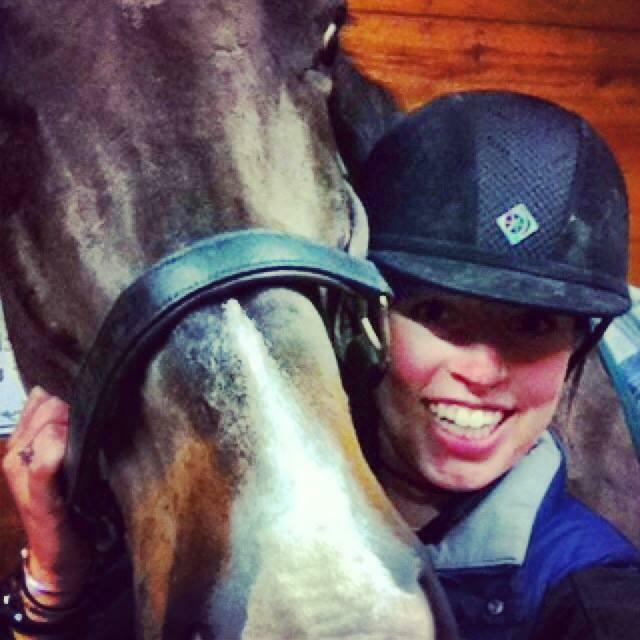 Today Dante is a different horse and I a much more knowledgeable, confident rider. He is relaxed, forward and on the bit. He beams with confidence and loves to work! I can now honestly say my horse and I are a true, communicative team due to Rita's patience, compassion and true understanding of the training scale. Rita empowers her students to become strong, knowledgeable, confident riders. Every lesson is a positive learning experience . Training with Rita and boarding at LMF has truly been a wonderful experience. Longmeadow Farm takes special care to understand the unique needs of each of our clients to design custom solutions that exceed expectations. Our attentive staff makes every effort to ensure you are 100% satisfied. ​My horse, Barcelona, and I have been at LMF for a year now and I couldn’t be happier with the quality of both the boarding and training. The facility is beautiful and meticulously maintained with excellent footing and a spacious indoor arena. Special care is taken by all of the staff to ensure all horses are healthy and happy. The atmosphere is professional and upbeat. When I arrived at LMF, I had recently purchased a young horse and was new to dressage myself—a challenging combination! Rita’s extensive experience in bringing horses up the levels was invaluable; she put together a comprehensive plan for my horse’s ongoing development that covered all aspects of his physical maturity and training. Rita took the time to establish a positive relationship with my horse from the beginning; because of this rapport, he has remained happy in his work while making impressive advances in his training. 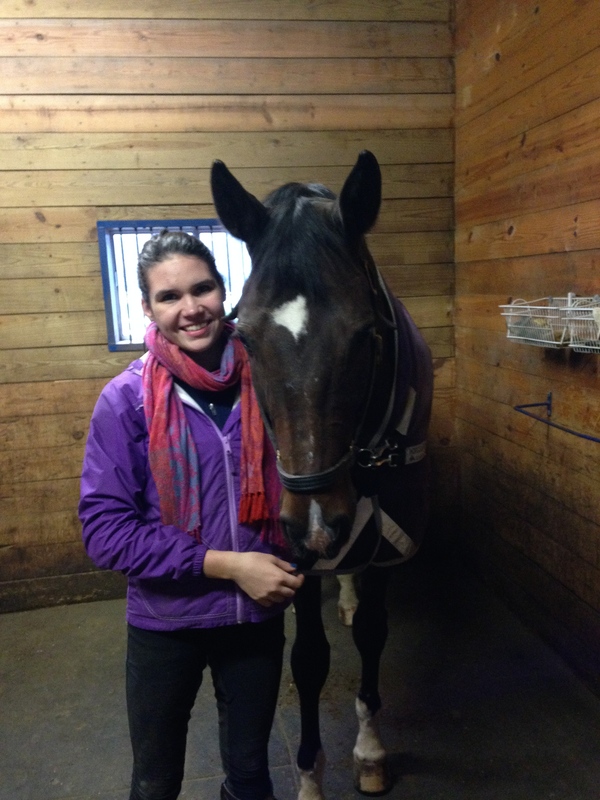 With Rita’s focused instruction, Barcelona and I have made great progress as a dressage team. 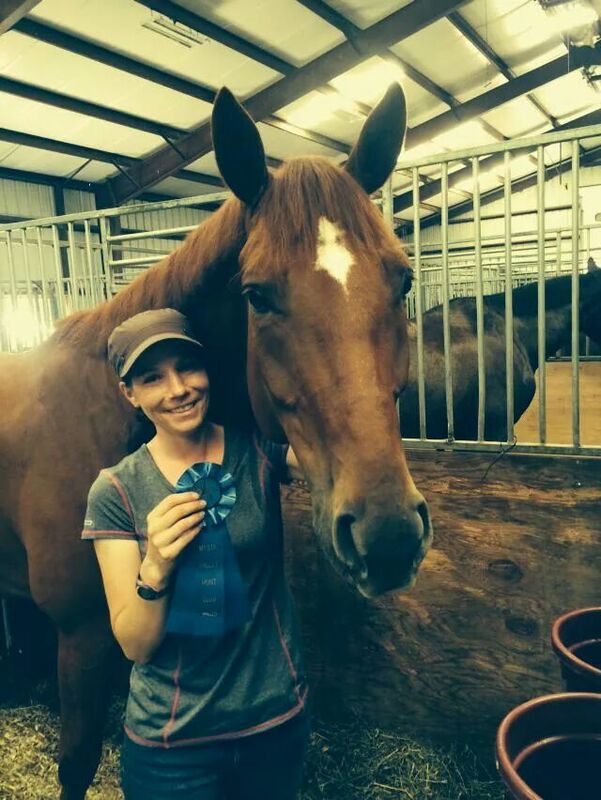 We recently began showing and I was thrilled to get the top score in one of our classes. Rita’s expertise and enthusiasm have made the challenge of learning dressage on a young horse a fun and rewarding experience. Barcelona and I have found our ideal home at LMF! 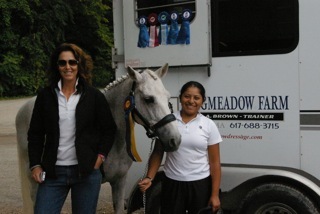 ​Rita Brown has been teaching me the foundations of correct dressage training for the past 10 years. I began lessoning with her at Longmeadow Farm at the age of 11. During my first lessons she instructed me on correct half-halting, as this was a necessary skill to develop for my speedy, beginner Appendix Quarter Horse. Over the years, Rita helped me to develop a steady and engaged seat and a mind that longed to practice and study the technical components of proper dressage riding. My freshman year of high school, Rita helped me through the process of buying a dressage horse, and in December of 2007, we purchased Milo, a seven year old Danish Warmblood. Throughout my high school years, Rita spent countless hours training Milo. Her tremendous efforts and patience encouraged Milo to develop into a safe, fun, and talented riding horse. As Milo became more comfortable, I became more confident as a dressage rider, and we developed a strong connection that created a feeling of partnership and trust. As we advanced, Rita would always remind of us of the pyramid of training. Over time we worked on riding forward over the back while also developing as sense of straightness and soft connection. I feel incredibly grateful to have started my training with Rita Brown at such a young age. Not only has she taught me how to ride correctly and love the sport of dressage, her instruction has encouraged me to be confident in myself and my abilities and these attributes have translated into many aspects of my life. As I progress through college and think about my future career I will forever be thankful for each and every lesson with Rita. Whenever I come home from my various travels one of my favorite and most relaxing things to do is have a lesson on Milo with Rita. I look forward to many more constructive and exciting years of training! ​We became hooked on Rita Brown as our dressage clinician in 2012 and were delighted to be able to switch over to having her as our trainer in 2013. Rita is smart, dedicated, intuitive, professional, mature, and a great mentor. She is a tremendously skilled rider and trainer who keeps the fitness of the horse and rider as the foundation for everything she works on. She has helped Sarah mature as a rider, build many new skills, diagnose problems, refine technique and learn the art of training, which is what Sarah plans to pursue after college. Longmeadow Farm is a beautiful place! It is a great facility, with great footing, great care, and wonderful outdoor spaces for the horses. The staff and clients are friendly and caring. You cannot do better than Rita Brown and Longmeadow Farm!